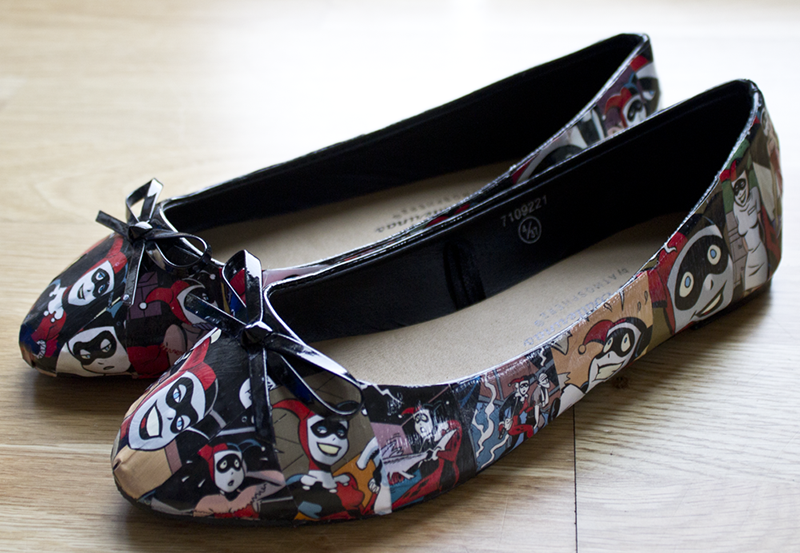 When I opened my Etsy store this summer, selling customised comic book shoes, I had no idea if it would be a success. In fact, I said to myself if I had no sales by the end of August I would give up on the idea. Thankfully, someone bought a pair and that I got the ball rolling. I don’t know how to judge success, but the fact that I’m making a profit and gaining great feedback feels like a success to me. Today I’m going to talk about my tiny Etsy business. Think of it as a behind the scenes tour. I don’t know about you but when I purchase something handmade from Etsy I always think about where it was made. Has the seller got a production line set up? Their own office? Is it just them or do they have other people making goods for them? I customise comic book shoes in my little one bedroom apartment that I share with the other half in the centre of Liverpool. I usually multi-task while making the shoes as the drying process is so slow. Typically I work at the dinning table, which can become a pain in the arse when we actually want to sit down to eat. Sometimes I work from my desk in the bedroom if I’m working on a particularly challenging piece of coursework at the time. Sometimes I sit on the floor and work on the coffee table in front of the TV if I’m feeling really relaxed. I spend about two weeks working on the shoes altogether. 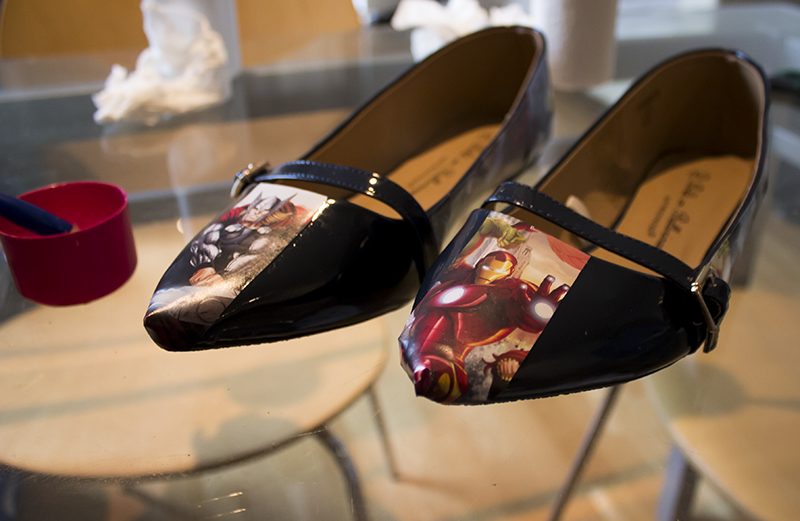 This time scale includes time taken to order the comics required and have them delivered, buy the shoes, buy packaging, decorate the shoes with comics, and then cover them with sealant. Oh yeah, and fitting in time to live my own life with university, work, eating, sleeping, etc. So, naturally I get quite annoyed when people expect me to get them complete in a shorter time span. At first, the shoes might look a little messy. But I guarantee once the many layers of gloss and selant are added the shoes really come to life. I absolutely love making Mad Love pairs, and they are highly requested. 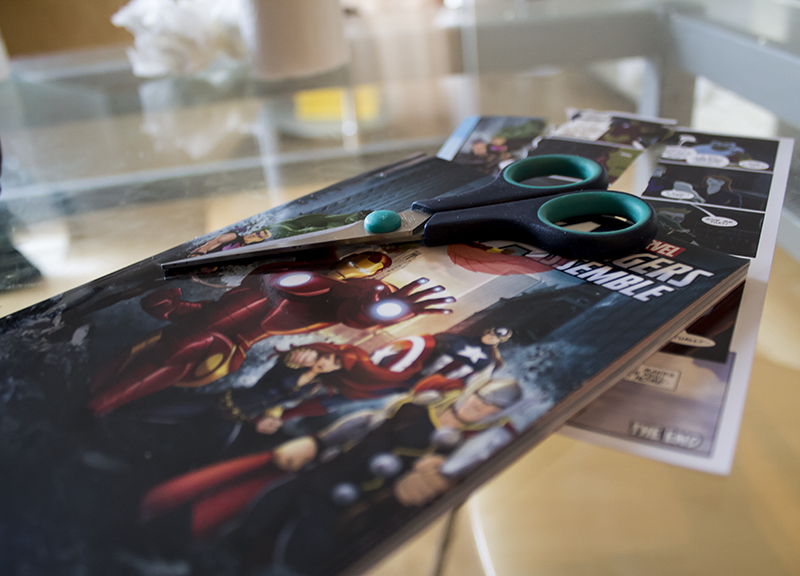 Right now I’m working on an Avengers pair (see top picture) and I’m really enjoying the change. If you are interested in purchasing a pair, take a look at my Etsy store for more information including prices. It’s good to know that it’s going well for you, I’d say this is a success and there’s an anticipation of what it could turn into and that’s the best, big things on your horizon! I always get annoyed when people expect work in a shorter time than it really takes. It’s why I stopped freelancing because people would expect a completed logo or design mock-up in only one day. Good work takes time! I hope your store continues to do well! The shoes look great, what a great idea.